REHABILITACIÓN Y MEDICINA FÍSICA. Mirando al futuro. : El brazo robótico que echa una mano a los pacientes que han sufrido un ictus. El brazo robótico que echa una mano a los pacientes que han sufrido un ictus. El Addenbrooke´s Hospital en Cambridge, Reino Unido es pionero en aplicación de terapias asistidas con robots para rehabilitación de hemiplejias. El robot ha sido desarrollado en la University of East London's (UEL) School of Health and Bioscience. (Sigue este enlace para más información). Brain Function & NeuRobotic Laboratory . Sigue este enlace para ver las opiniones de los primeros pacientes, los médicos responsables y fisioterapeutas responsables. Es realmente excitante ver los primeros pasos en la clínica de estas nuevas tecnologías para rehabilitación y medicina física. Habría que tener en cuenta que en rehabilitación (en cuanto a terapias) se han producido muy pocos avances en las últimas décadas, ¿está llegando el turno de la modernización y avances tecnlógicos para rehabilitación? No deberíasmos verlo tan lejos. Hace 25 años un hospital regional en España podía presumir ser uno de los pocos que disponían de un TAC. El precio lo hacía prohibitivo. Hoy la mayoría de los hospitales regionale sno solo tienen TAC sino también resonancias magnéticas o al menos se dispone de estas pruebas en centros concertados. and Rehabilitation at UEL’s School of Health and Bioscience. Una cuestión que estos avances me plantean es ¿por qué no estamos teniendo cosas similares en España o en otros países de habla hispana? Tal vez estemos retrasándonos otra vez en tecnología. STROKE victims at Addenbrooke's Hospital are being helped by a robot arm, the first of its kind in the UK. The stroke rehabilitation robot is helping patients at the Cambridge hospital get movement back in their shoulders and arms. The robot has been set up by researchers from the University of East London's (UEL) School of Health and Bioscience. They want to investigate the best ways of using the new equipment to help patients recover from strokes more quickly. Tony Seddon, the first patient to benefit, said: "This is the hardest I've had to work since my stroke. The robot is doing things you can't do in any other way. Stretching, concentration, precise movement - they're all combined." 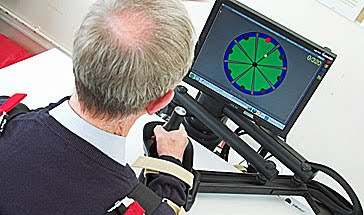 The patient sits at a desk, holding hands with a jointed arm connected to the robot's control system. In front of them, a screen shows a clock face with a moving coloured spot. The challenge is to follow the spot with a pointer controlled by the patient's hand. Will Winterbotham, who leads the team of physiotherapists using the equipment, said: "When Tony's muscles are working well, the robot leaves him to get on with the exercise. But when he struggles or shakes, it guides him in the right direction. As he gets better, it helps him less and less - so over time his body learns to make the right movements rather than the wrong ones." Professor Duncan Turner, from UEL, said: "The key to success is repetition, repetition, repetition. Under a trained therapist's supervision, the robot can be programmed to help patients with tasks like reaching out and picking things up. It can carry out 1,000 repetitions an hour - a human physiotherapist could never match that level of intensity." 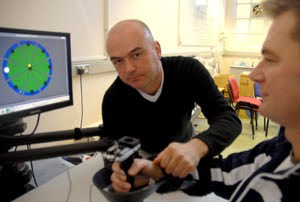 Joe Korner, from the Stroke Association, said: "Repetition of movement can create new pathways in the brain - and this robot really does help people to do that. By guiding, it's also telling the brain what movements and what thought patterns it needs to do." "My shoulder is more relaxed. I can definitely feel the muscles getting stronger, and my arm is more flexible. "For the first time since my stroke I can bend my elbow and scratch my nose." Publicado por Unknown en 10/27/2009 02:34:00 p. m.